Sarah Gambito is the author of the poetry collections Loves You (Persea Books), Delivered (Persea Books) and Matadora (Alice James Books). Her poems have appeared or are forthcoming in The Iowa Review, POETRY, Harvard Review, American Poetry Review, The New Republic and other journals. She holds degrees from The University of Virginia and The Literary Arts Program at Brown University. Her honors include the Barnes & Noble Writers for Writers Award from Poets and Writers, The Wai Look Award for Outstanding Service to the Arts from the Asian American Arts Alliance and grants and fellowships from The New York Foundation for the Arts and The MacDowell Colony. She is Associate Professor of English / Director of Creative Writing at Fordham University and co-founder of Kundiman, a non-profit organization serving writers and readers of Asian American literature. Helene Achanzar is a senior editor of Yalobusha Review. HA: Congrats on the new book! Loves You opens with a poem entitled “On How to Use this Book.” It’s a poem that contains a recipe in a book that’s filled with many recipes. Loves You seems invested in, almost fascinated by, instruction. I’m curious about how the directive nature of recipes works in relationship to the mostly non-narrative poems in the collection. I wonder to what extent these recipes are guides, not just to cooking dishes, but also to framing the questions your poetry asks about place, family, and identity. SG: After the 2016 election, I was seeing America in a completely different way. My family was on opposite sides of voting and belief. I found comfort in the imperative form of the recipe as a poetic form. Do this and something else is ushered into being. Do this and other pathways become possible. I love the implied alchemy of what becomes manifest within the text of a recipe. 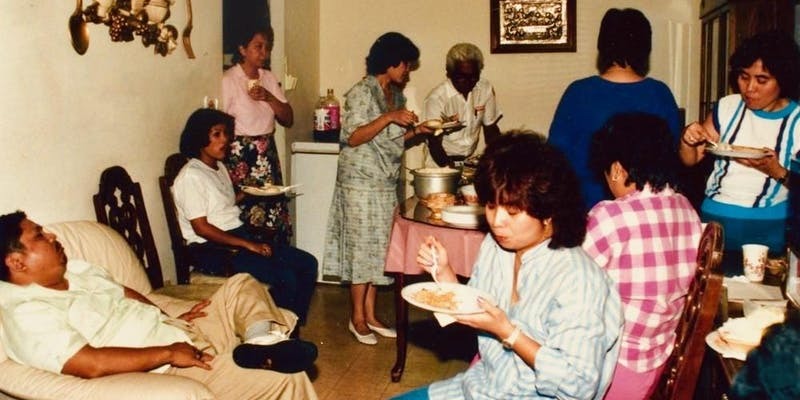 I don’t speak Tagalog and so food is the common language that I can speak with my family. So, a “cookbook” of poems became a way for me to speak to a kind of impossible, intimate other. HA: In Matadora, you went to dinner with New York, spent the night with New York. In Delivered, you dreamt that you were in Manila, that you lived in Manila, that Manila was your address. It has been ten years since Delivered. Where have you been? Where did you go to write Loves You? SG: Most of all, I had a son and became mortal in a completely unexpected way. I wanted to find a language that could speak to this new experience of providing for and feeding another person. This is yet another reason why I found poems in recipes. HA: In each of your books you include voices and perspectives from a wide range of sources. The new collection responds to quotes from The New Yorker and GQ, it adapts recipes from professional chefs and home cooks, and it contains two photographs. Your poetry demands that readers pay attention, that we care and care deeply. What sort of responsibility, if any, do you believe you carry in your art? SG: I love the raw crystalline form of poetry– allowing for no quarter. Maximum living through literature. I don’t want to waste my time or anyone else’s. I don’t hope for a rush of the intellect. I crave avalanche feeling no matter what. HA: I love this idea of maximum living through literature. One of the ways I see that happening in Loves You is through the things that decorate and adorn the body. In one poem, you are the young girl with moon lipstick. In another, you wear a yellow dress. In “Marriage” you ask, “Why should we not have beautiful earrings?” In other poems, there are nails painted gold, gold clips in your hair, a golden wig. There are bracelets and flashdance costumes and choir robes and leather jackets in this book. How did style and beauty make their way into the collection? SG: The desire for style and beauty figures in as an ambivalent inheritance. The “I” is wearing moon lipstick and breaking eggs everywhere. Implicit in the question, “Why should we not have beautiful earrings?” lies that idea that one does not already have these things. Moments of abundance are syncopated with lack. Style/beauty becomes a way to articulate an immigrant experience that can simultaneously feel rich and desperate and strong and yearning. HA: I want to end on this idea of lack – not to focus on what’s missing, but to instead consider the hope for something better, something more. Loves You closes with a poem entitled “Brave, Brave, Brave” in which a choir director says, “I want more than singing. Cradle me in this song.” What are your hopes for poetry? What do you believe poetry can be or do, especially now in a time of American tumult? SG: I would like for poetry to be as usable as a recipe. I would like for it to be a map, a locatable way of being and interacting. I want to be able to point to it and say: This gives me a way to think and feel and test myself. I’m impatient with an esoteric language. Gather friends around your tables of plenty. This need not be more than bowls of arroz caldo. We need radical conversation and pro-tips about how to move forward.